Residents at Kingsmere will benefit from a number of planned new community facilities including new schools, a village centre, recreation and sports facilities. The new village centre planned for Kingsmere will provide residents with essential day-to-day facilities including a convenience store and local shops, multi-use community centre with a separate youth centre building, day nursery, car parking and community recycling centre. As well as providing residents with a great range of new facilities on their doorstep, the Kingsmere Village Centre will become a place for people to meet, socialise and relax. Kingsmere is top of the class when it comes to educational facilities, with three new schools planned on site, and a great choice of schools to choose from locally. The first new primary school at Kingsmere opened in January 2016 allowing St Edburg’s Church of England Primary School in Bicester to relocate and double in size. The new state of the art premises includes outdoor learning spaces, a multi-use games area, sports pitches, sensory garden and nursery play area. Plans for the new 600-place secondary school for 11-16 year olds are already underway by Oxfordshire County Council. Located next to the community Sports Village pupils will enjoy full use of the facilities and sports pitches. For further education, nearby Oxford University and Oxford Brookes need no introduction. At Kingsmere, residents have room to breathe – with extensive green open spaces across the development, there’s space to explore, play, relax and enjoy. It’s not just people flocking to make a home at Kingsmere. With acres of open space, enhanced habitats have been created attracting a wide variety of bird and butterfly species to settle here. Pingle Brook is an informal recreational space, perfect to relax and enjoy a picnic or take a seat on one of the many public art benches and observe the wildlife. In contrast, Whitelands Park offers more open space with an adventure playground, mini sports pitch, climbing areas and aerial runway. Smaller areas for younger children can be found nestled amongst the new homes throughout the village. Encouraging a healthy and active lifestyle is a central part of the vision for Kingsmere. Living here will mean a wide range of facilities on the doorstep for all the family to enjoy. Opened in September 2017, the Whitelands Farm Sports Village provides first class sporting amenities for the local community and the proposed secondary school. Three full size rugby pitches, three junior football pitches and a cricket pitch are in regular use. The pitches are surrounded by a three metre wheelchair-friendly cycle track. The sports pavilion benefits from changing facilities, café and function room, together with floodlit all-purpose Astro-pitches. The new Premier Inn Hotel and Brewers Fayre restaurant at Kingsmere are perfect for when family and friends want to come and visit you in your brand new home. They can combine their visit with a trip to the most talked about designer shopping centre, Bicester Village, just across the road. 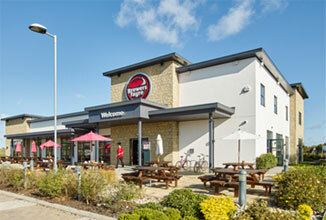 The new hotel and restaurant are open seven days a week offering family dining and accommodation.